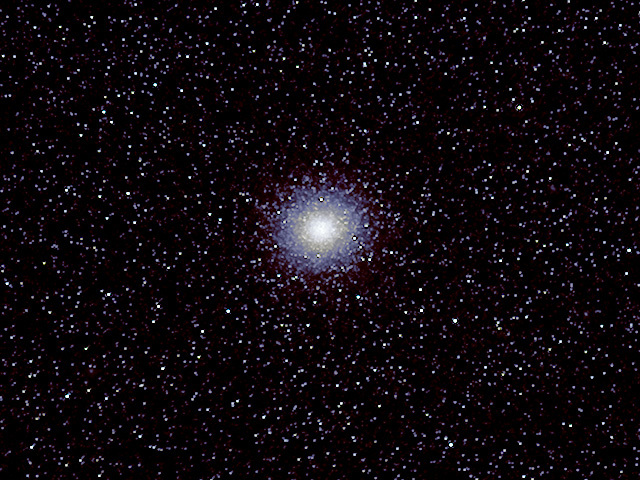 Seeing and imaging Omega Centauri is always a treat. Even in the Big Bend of Texas it only gets about 10 degrees above the southern horizon. After days of clouds in Austin our 2nd night in Terlingua was spectacularly dark and clear. Seeing was only average and deteriorated. I only used the first 75 minutes of data in this image. This was my first dark sky shoot with this classic Nikkor 180mm ED lens and I'm very pleased with the result. Nikkor 180mm ED lens and Sony a6300 camera. Vixen Polarie star tracking mount. Exposure 30 seconds at ISO 400 stopped down to f/4 on 2019-04-01 03:26UT 05:17-07:23 UT. Best 152 images stacked in Nebulosity. Exposure stretched, color corrected, and cropped in Photoshop.